Organize, edit, and share your photos with ON1 Photo RAW 2019. This well-illustrated, no-nonsense book explains everything you need to get the most out of ON1 Photo RAW 2019. 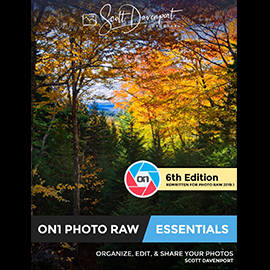 It is the most comprehensive book for ON1 Photo RAW 2019 out there. This book explains everything about ON1 Photo RAW 2019. Scott explains the fundamentals of organizing and tagging photos, non-destructive editing, layers & masking and how to use these features together to process your photos. Masking, blending modes, and blending options. Including luminosity masks! Throughout the book, Scott has short exercises to reinforce key concepts. The book includes instructions to download sample RAW images, so you can follow along with the exercises step by step. Also, throughout the book are notes on why Scott finds a feature or slider useful and when he uses them with his photography. This is the book to get up to speed with ON1 Photo RAW 2019. Note: The book is ~224MB and may take a while to download. Practice images are a separate download of ~381MB. Download instructions are in the PDF book. Practice images are included! Follow along with step-by-step exercises and get to know ON1 Photo RAW 2019.